Here’s the finished article and a first look at the cover copy for the UK edition. Very different from the US version (which the artist Christian McGrath styled on the work of Caravaggio, fact fans), but I like the sense of adventure and intrigue here too. The front cover photo is by Jonathan Ring and the design by Stephen Mulcahey. 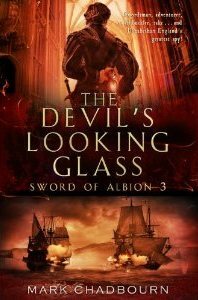 The Sword of Albion is out in the UK from Bantam in May and you can pre-order it here.